HELIOS was the Titan-god of the sun who presided over the various facets of the heavenly body, from the measurement and divisions of the day, year and the seasons, to the powers of heat and fire, and the gift of sight. This page contains descriptions of the god's divine functions. "And now, O Mousa Kalliope (Muse Calliope), daughter of Zeus, begin to sing of glowing Helios (the Sun) whom mild-eyed Euryphaessa (Wide Shining), the far-shining one, bare to the son of Gaia (Gaea, the Earth) and starry Ouranos (Uranus, the Heaven). For Hyperion wedded glorious Euryphaessa, his own sister, who bare him lovely children, rosy-armed Eos (the Dawn) and rich-tressed Selene (the Moon) and tireless Helios (the Sun) who is like the deathless gods. As he rides in his chariot, he shines upon men and deathless gods, and piercingly he gazes with his eyes from his golden helmet. Bright rays beam dazzlingly from him, and his bright locks streaming form the temples of his head gracefully enclose his far-seen face: a rich, fine-spun garment glows upon his body and flutters in the wind: and stallions carry him. Then, when he has stayed his golden-yoked chariot and horses, he rests there upon the highest point of heaven, until he marvellously drives them down again through heaven to Okeanos (Ocean-Stream). Hail to you, lord! Freely bestow on me substance that cheers the heart. And now that I have begun with you, I will celebrate the race of mortal men half-divine whose deeds the Mousai (Muses) have showed to mankind." "To Helios (Sun), Fumigation from Frankincense and Manna. Hear, golden Titan, whose eternal eye with matchless sight illumines all the sky. Native, unwearied in diffusing light, and to all eyes the object of delight: Lord of the seasons, beaming light from far, sonorous, dancing in thy four-yoked car. With thy right hand the source of morning light, and with thy left the father of the night. Agile and vigorous, venerable Sun, fiery and bright around the heavens you run, foe to the wicked, but the good man's guide, over all his steps propitious you preside. With various-sounding golden lyre 'tis thine to fill the world with harmony divine. Father of ages, guide of prosperous deeds, the world's commander, borne by lucid steeds. Immortal Zeus, flute-playing, bearing light, source of existence, pure and fiery bright; bearer of fruit, almighty lord or years, agile and warm, whom every power reveres. Bright eye, that round the world incessant flies, doomed with fair fulgid rays to set and rise; dispensing justice, lover of the stream, the world's great master, and over all supreme. Faithful defender, and the eye of right, of steeds the ruler, and of life the light: with sounding whip four fiery steeds you guide, when in the glittering car of day you ride, propitious on these mystic labour shine, and bless thy suppliants with a life divine." "Now Helios (the Sun) of a new day struck on the ploughlands, rising out of the quiet water and the deep stream of Okeanos (Oceanus) to climb the sky." "And now the shining light of the sun (helios) was dipped in the Okeanos (Oceanus) trailing black night (nyx) across the grain-giving land." "Leaving the lovely lake of Okeanos, (Oceanus)Helios (the Sun) leapt upwards into the brazen sky, bringing light for the Deathless Ones, bringing it too for mortal men who live on the earth that gives them grain." "The island of Aiaia (Aeaea) [home of Helios' daughter Kirke (Circe)]; it is there that Eos (the Dawn) the early comer has her dwelling-place and her dancing-grounds, and Helios (the Sun) himself has his risings." "The streams of Okeanos, the White Rock (petra Leukas), the Gates of the Sun (pylai Hêlioi) and the Land of Dreams (demos oneiroi)." "Tireless Helios (the Sun) who is like the deathless gods. As he rides his chariot, he shines upon men and deathless gods, and piercingly he gazes with his eyes from his golden helmet. Bright rays beam dazzlingly from him, and his bright locks streaming from the temples of his head gracefully enclose his far-seen face: a rich, fine-spun garment glows upon his body and flutters in the wind: and stallions carry him. Then, when he has stayed his golden-yoked chariot and horses, he rests there upon the highest point of heaven, until he marvellously drives them down again through heaven to Okeanos (Oceanus)." "[Helios] called to his horses : and at his chiding they quickly whirled the swift chariot along, like long-winged birds." "Helios (the Sun) was going down beneath the earth towards Okeanos with his horses and chariot." 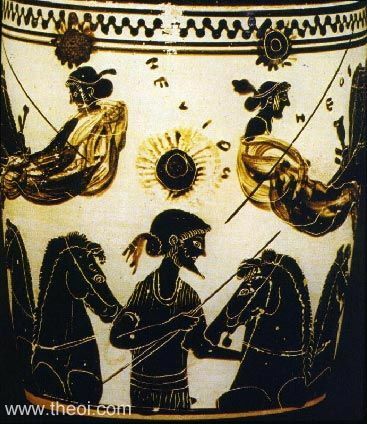 "[Athena was born from the head of Zeus :] Bright Hyperionides [Helios the Sun] stopped his swift-footed horses a long while until the maided Pallas Athene had stripped the heavenly armour from her immortal shoulders." 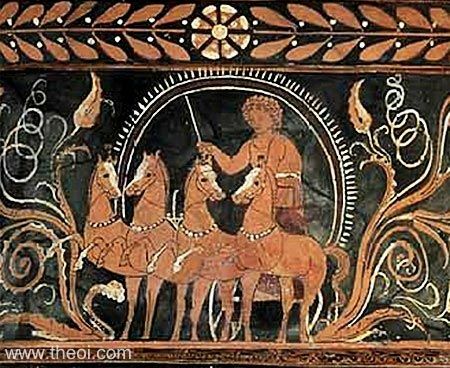 "For Helios' (the Sun's) lot is toil every day and there is never any respite for him and his horses, from the moment rose-fingered Eos (the Dawn) leaves Okeanos (Oceanus) and goes up into the sky. A lovely bed, hollow, forged by the hands of Hephaistos, of precious gold and winged, carries him, as he sleeps soundly, over the waves on the water's surface from the place of the Hesperides (the Evenings) [in the West] to the land of the Aithiopes (Ethiopians) [in the East], where his swift chariot and horses stand until early-born Eos (the Dawn) comes. There the son of Hyperion [Helios] mounts his other vehicle." "That Helios (the Sun) too was conveyed to his setting in a cup Stesikhoros tells us in the following words : ‘And then strong Hyperionides [Helios] went down into the cup of solid gold, so that he might cross over Okeanos and reach the depths of holy, dark night and his mother [Theia] and wedded wife and dear children.’"
"Stesikhoros says that Helios (the Sun) sailed across Okeanos in a cup." "Great Helios who begets the fierce rays of the sun." "Where, in the west, is the bowl wrought by Hephaistos, the bowl of thy sire [Helios], speeding wherein he crosseth the mighty, swelling stream that girdeth earth [i.e. Okeanos], fleeing the gloom of holy Nyx (Night) of sable steeds." "Helios (the Sun), cleaving the ageless vault of heaven." "The many-eyed embroidery of blue-black Nyx (Night), and at once rose Hyperionides [Helios the Sun], hard-toiling eternally, almighty." "Phoibos (Phoebus) [Helios the Sun], who, from the summit of his chariot, sets the world aflame with his dazzling rays, Phoibos, a mighty deity amongst the gods and adored amongst mortals." Sokrates : Let us inquire what thought men had in giving them [the gods] their names . . . The first men who gave names [to the gods] were no ordinary persons, but high thinkers and great talkers . . . But why should you not tell of another kind of gods, such as sun, moon, stars, earth, ether, air, fire, water, the seasons, and the year? What, then, do you wish first? Shall we discuss the sun (hêlios), as you mentioned it first? . . . I think it would be clearer if we were to use the Doric form of the name. The Dorians call it halios. Now halios might be derived from collecting (halizein) men when he rises, or because he always turns (aei heilein) about the earth in his course, or because he variegates the products of the earth, for variegate is identical with aiollein." "He [Orpheus] sang of . . . how the Astra (Stars), Selene (the Moon), and travelling Helios (the Sun) keep faithfully to their stations in the heavens." "Helios (the Sun) came back from the world's end to light the dewy hills and wake the shepherds." "It was evening. Out in the west, beyond the farthest Aithiopian (Ethiopian) hills, Helios (the Sun) was sinking under the darkening world; Nyx (Night) was harnessing her team [of horses]." "Bright as Helios' (the Sun's) round face when he rises fresh from Okeanos stream." "The god Helios (the Sun) never passes by that beauteous dance [of Artemis and her Nymphs], but stays his car to gaze upon the sight, and lights of day are lengthened." "From the Okeanos-verge upsprings Helios (the Sun) in glory, flashing fire far over earth." "Helios (the Sun) drave down his never-wearying steeds into the dark west : night streamed o'er the earth, bidding men cease from toil." "Golden Titan [Helios the Sun], whose eternal eye with matchless sight illumines all the sky. Native, unwearied in diffusing light, and to all eyes the object of delight: Lord of the seasons, beaming light from far, sonorous, dancing in thy four-yoked car. With thy right hand the source of morning light, and with thy left the father of the night. Agile and vigorous, venerable Sun, fiery and bright around the heavens you run . . . borne by lucid steeds . . . Bright eye, that round the world incessant flies, doomed with fair fulgid rays to set and rise . . . of steeds the ruler, and of life the light: with sounding whip four fiery steeds you guide, when in the glittering car of day you ride." "[At dawn :] A song which the blast of wind from snowy Threike (Thrace) [i.e. Boreas], dancing upon the wintry waves of the sea, sings to the surge at dawn. And sweetly it sings how the snow-white brightness of blazing Phaethon Helios [the Sun] is quenched by the liquid streams of rainclouds, and the fiery . . of the dog-star is extinguished by the watery snowstorms . . .
[At dusk :] The steeds of Phaethon [Helios], beating the path of heaven beneath their hooves, were drawing the dew-moist rail of their twilight chariot toward their drinking-pool in the western sea . . . The eagle, royal bird of aigis-bearing Zeus, knows how to call for witness of his noble birth the heavenly ray of the sun's (helios') golden gleam." "When Titan [Helios] perceived the Morning Star [Eosphoros] setting and saw the world in crimson sheen . . . he bade the nimble Horae (Hours) go yoke his steeds, and they, swift goddesses, fastened the jingling harness and the reins, as from the lofty stalls the horses came, filled with ambrosial food and breathing flame." "Until Lucifer [Eosphoros the Dawn-Star] should wake Aurora [Eos the Dawn], and Aurora call forth the chariot of the day [Sol-Helios the Sun]." "That far sea [Oceanus] that greets the panting horses of Sol (the Sun) [Helios] and welcomed their tired wheels." "Three times had Phoebus [Sol-Helios the Sun] had now unyoked his team when they had plunged in Hibero's sunset stream [i.e. the Atlantic Ocean beyond Spain]." "When Titan is urging aloft his radiant steeds." "Whether Phoebus [Sol-Helios the sun] be hid, or high above the earth he rise." "When Titan shows his face and lights up all the earth." "Sol (the Sun) [Helios]was making ready to take their yokes from his shining steeds. When he has likewise called them once more to their accustomed rising." "Where dwell the tribes of Scythia by the waters of Maeotis . . . 'Tis even winter; ever Caurus (the Northwest Wind) blasts, with icy breath. Then, too, never does Sol (the Sun) [Helios] scatter the pale mists, either when, borne on his chariot, he climbs high heaven, or when he laves his headlong car in Oceanus' crimson plain." "Where Sol (the Sun), as he brings back, and where, as he dismisses day, colours both Ethiop races [i.e. of the farthest East and farthest West] with neighbouring torch." "Now stars shine few and faint in the sinking sky; vanquished night draws in her wandering fires as the new day is born, and Phosphorus (the Morning Star) brings up the rear of the shining host; the icy sign high in the north, the Bears of Arcas, with their seven stars, with wheeling pole summons the dawn. Now, upborne by his azure steeds, Titan [Helios the Sun] peeps forth from Oeta's crest; now the rough brakes . . . touched by the dawn, flush red, and Phoebus' sister [Selene the Moon] flees away, to return again. Hard toil arises, sets all cares astir, opens all doors." "O lord of kindly light [Sol-Helios the Sun], glory of heaven, who in thy flame-bearing car dost circle both spaces of the sky, and dost show thy shining face to the broad lands, pardon, O Phoebus [Sol-Helios], if any unlawful sight thine eyes have seen." "And thou [Sol-Helios the Sun] above all, who ever the lands and stretches of the sea dost shed thy rays, and dispellest night with comely face, O glowing Titan; equally with thee hath Alcides [Herakles] seen the lands of thy setting and thy rising, and hath known both thy dwellings." "[Medea speaks :] ‘Behold him [Sol-Helios the Sun] as, sitting in his chariot, he courses over bright heaven's accustomed spaces? Why does he not return to his rising and measure back the day? Grant, oh, grant that I ride through the air in my father's car; give me the reins, O sire, give me the right to guide thy fire-bearing steeds with the flaming reins.’"
"Now, O Phoebus [Helios the sun], speed thy chariot with no check of rein; let friendly darkness veil the light and let Hesperus (the Evening Star), vanguard of the night, plunge deep this fearful day." "Now night is driven away; hesitant Titan [Sol-Helios the Sun] returns, and rises, sadly veiling his beams in murky cloud; with woeful flame he brings a light of gloom and will look forth upon our homes stricken with ravening plague." "The shores of the ruddy sea [the Indian Ocean], whence Phoebus [Sol-Helios the Sun] discloses his rising beams, opens the gates of day, and with nearer torch darkens the naked Indians." "The radiant goddess [Luna-Selene the Moon] of the darksome sky burned with love [for Endymion] and, forsaking the night, gave her gleaming chariot to her brother [Sol-Helios the Sun] to guide in fashion other than his own. He learned to drive the team of night and to wheel in narrower circuit, while the axle groaned beneath the car's heavier weight; nor did the nights keep their accustomed length, and with belated dawning came the day." "Hide thee in the woods when Titan [Sol-Helios the Sun] has brought midday." "Titan [Sol-Helios the Sun] was just grazing the hill-tops with his morning rays and day had vanquished night." "As Phoebus' [Sol-Helios the Sun's] light is wont to appear more glorious at the moment of his setting, when the stars come back to their stations and the uncertain daylight is dimmed by the approach of night." "The stars are now gliding into the life-giving springs of mighty Oceanus, and the bridles are jingling in the Titanian caves [of Sol-Helios the Sun]; hastened by the golden-haired Horae (Hours) Sol (the Sun) [Helios] puts on his diadem of myriad rays and the corselet woven of twelve stars and bound by the belt which athwart the rain-clouds shows for men its many hued bow. Then above the earth and above the horns of the eastern mount he shone forth, and drew a train of light over the sparkling waves." "Iron Atlas stands in Oceanus, the wave swelling and breaking on his knees; but the god himself [Sol-Helios the Sun] on high hurries his shining steeds across the old man's body, and spreads light about the curving sky." "The sky's furthest bounds . . . whereon Sol (the Sun) [Helios] looks when he issues from the eastern gate and when he sinks into his Iberian haven, or the lands he touches afar with his slanting devious ray." "Far on the sloping margin of the western sea sinking Sol (the Sun) [Helios] had unyoked his flaming steeds, and laved their bright manes in the springs of Oceanus; to meet him hastens Nereus of the deep and all his company, and the swift-striding Horae (Hours), who strip him of his reins and the woven glory of his golden coronet, and revive his horse's dripping breasts of the hot harness; some turn the well-deserving steeds into the soft pasture, and lean the chariot backward, pole in air." "It was the time when Phoebus' [Sol-Helios the Sun's] fiery sister [Eos the Dawn], hearing the sound of his yoked steeds and the roar of Oceanus' cavernous abode beneath the gathering dawn, collects her straying beams and with light flick of whip chases the stars away." "Not ye had the wakeful dawn put all the stars to flight from heaven, and Luna (the Moon) [Selene] was beholding the approach of day with fading horn, what time Tithonia [Aurora-Eos the Dawn] scatters the clouds in hurrying rout, and prepares the wide firmament for the return of Phoebus [Sol-Helios the Sun]." "Already had father Titan [Sol-Helios the Sun] hidden his flaming chariot in the Hesperian flood [i.e. the western ocean], to emerge again from other waves." "On the verge of Oceanus' waves beholdest Hyperion [Sol-Helios the Sun] slope downward to this setting, and hearest the hiss of plunging wheels." "But even deities have their laws : in thraldom the swift choir of the Astra (Stars), in thraldom is wandering Luna (the Moon) [Moon], not unbidden is the light whose path so oft returns [Sol-Helios the Sun]." "By now Sol (the Sun) [Helios] had glided down beneath Oceanus, and was giving light to the regions of the world below the earth [i.e. the subterranean Elysium, cf. Virgil above]." "[Zeus] resolved to mount Semele's nightly couch, and turned his eye to the west, to see when sweet Hesperos (the Evening Star) would come. He blamed Phaethon [Helios the Sun] that he should make the afternoon season so long, and uttered an impatient appeal with passionate lips : ‘. . . Helios (the Sun), you plague me, though you know the madness of love. Why do you spare the whip when you touch up your slow team? I know another nightfall that came very quickly! If I like, I will hide you and the daughter of the mists [Eos the Dawn] together in my clouds, and when you are covered Nyx (Night) will appear in the daytime, to speed the marriage of Zeus in haste; the stars will shine at midday, and I will make rising Hesperos (the Evening Star), instead of setting Hesperos, the regular usher of the loves. Come now, draw your own forerunner Phosphoros (the Dawn Star) to his setting, and do grace to your desire and mine; enjoy your Klymene (Clymene) all night long, and let me go quick to Semele.’"
"[Helios the Sun] had just finished his course and come down from the sky. Bright Phosphoros (the Morning Star) was ready for the fire-eyed driver, near his chariot and four. He put away the hot yokestraps and starry whip, and washed in the neighbouring Okeanos stream the bodies of the firefed horses wet with sweat. The colts shook the dripping manes on their necks, and stamped with sparkling hooves the shining mangertrough." "O Helios (the Sun), cutting the air in your fiery chariot, pouring your light on the Kaukasian (Caucasian) plowland so near." "For verily through them all [the constellations of the zodiac] Helios the Sun passes in yearly course, as he drives his mighty furrow, and now to one, now to another he draws near, now as he rises and anon as he sets, and ever another star looks upon another morn." "[Phoebus the Sun describes his path across the sky :] ‘In constant flux the sky streams by, sweeping in dizzy whirl the stars on high [i.e. the movement of the constellations]. I drive against this force, which overcomes all things but me, and on opposing course against its rushing circuit makes my way. Suppose my chariot yours: what then? Could you confront the spinning poles [of the sky] and not be swept away by the swift axis of the world? Perhaps you fancy cities of gods are there and groves and temples rich with offerings. No! Wild beasts lie in wait and shapes of fear! And though you shall meet Taurus (the Bull), must brave his horns, and face Arcus Haemonius (the Thessalian Archer) [Sagittarius] and the ravening Leo (the Lion), the long curved circuit of Scorpio's claws, Cancer (the Crab) whose claws in counter-menace wave.’"
"[Phoebus instructs Phaethon on the zodiac-pathways of the sun :] ‘Avoid the road direct through all five zones; on a wide slanting curve the true course lies within the confines of three zones; beware alike the southern pole and northern Arctus (Bear). Keep to this route; my wheeltracks there show plain. Press not too low nor strain your course to high; too high, you'll burn heaven's palaces; too low, the earth; the safest course lies in between. And neither rightwards towards the twisting Anguis (Snake) [Serpens] nor leftwards swerve to where the Ara (Altar) lies. Hold in the midst! To fortune I resign the rest to guide with wiser wit than yours.’"
"The golden Sun (Sol) [Helios] rules his circuit, portioned out in fixed divisions, through the world's twelve constellations. Five zones comprise the heavens [the Tropics]; whereof one is ever glowing with the flashing sun, ever scorched by his flames. Round this, at the world's ends, two stretch darling to right and left, set fast in ice [the far North] and black storms [the far South]. Between these and the idle zone, two by grace of the gods have been vouchsafed to feeble mortals; and a path is cut between the two, wherein the slanting array of the Signs may turn." "When the fifth summer has brought back the sacred games . . . when the time comes again for night to lengthen and the balanced Scales [Libra], yearning for quiet slumber, check Phoebus' [Sol-Helios the sun's] car." "Thou [Sol-Helios the Sun], greatest glory of the unclouded sky, who presidest over the twelve signs in thy changing course, who doest unroll the slow centuries with swift wheel; and thou, his sister, ever faring opposite to thy brother, Phoebe [Luna-Selene the Moon], night-wanderer." "With such whirlwind speed as the twelve signs fly along, with such swift course as the lord [Helios the sun] of stars hurries on the centuries, and in such wise as Hecate [Selene the moon] hastens along her slanting ways, so do we all seek fate." "[Helios instructs his son Phaethon on the zodiac-pathways of the sun :] ‘There are twelve houses in all the fiery aether, set in the circle of the rounded Zodiakos (Zodiac), one close after another in a row, each separate; though these alone is the inclined winding path of the restless Planetoi (Planets) rolling in their courses. All round these Kronos [the planet Saturn] crawls from house to house on his heavy knees along the seventh zone upon the circle, until at last with difficulty he completes thirty circuits of returning Selene [i.e. two and a half years]. On the sixth, quicker than his father, Zeus [the planet Jupiter] has his course opposite, and goes his round in a lichtgang. By the third, fiery Ares [the planet Mars] passes [one sign of the Zodiac] in sixty days, near your father. I myself [Helios the Sun] rise in the fourth, and traverse the whole sky garland-wise in my car, following the winding circles of the heavenly orbits. I carry the measures of time (khronos), surrounded by the four Horai (Seasons), about the same centre, until I have passed through a whole house and fulfilled one complete month as usual; I never leave my journey unfinished and change to a backward course, nor do I go forward again; since the other Asteres (Stars), the Planetoi (Planets), in their various courses always run contrary ways: they check backwards, and go both to and fro; when the measures of their way are half done they run back again, thus receiving on both sides my one-sided light [i.e. half of the planets, including the moon, travel above and half below the path of the sun, so each receives his light on only one side]. One of these Planetoi (Planets) is horned Selene (the Moon) whitening the sky; when she has completed all her circuit, she brings forth with her wise fire the month, being at firs half seen, then curved, then full moon with her whole face. Against Mene the Moon I move my rolling ball, the sparkling nourisher of sheafproducing growth, and pass on my endless circuit about the turning-point of the Zodiakos (Zodiac), creating the measures of time. When I have completed one whole circle passing from house to house I bring off the lichtgang. Take care of the crossing-point itself [i.e. where the moon cuts the ecliptic], lest when you come close, rounding the cone of darkness with your car, it should steal all light from your overshadowed chariot. And in your driving do not stray form the usual circuit of the course, or be tempted to leave your father's usual goal by looking at the five parallel circles [i.e. the arctic, two tropic, equatorial and Antarctic circles] with their multiple bond of long encompassing lines, or your horses may run away and carry you through the air out of your course. Do not, when you look about on the twelve circles [i.e. the twelve signs of the zodiac] as you cross them, hurry from house to house. When you are driving your car in Krios (the Ram) [Aries], do not try to drive over the Tauros (the Bull). Do not seek for his neighbour the Scorpion [Scorpio] moving among the stars, the harbinger of the plowtree, when you are driving under the Balance [Libra], until you complete thirty degrees. ‘Just listen to me, and I will tell you everything. When I reach Krios (the Ram), the centre of the universe, the navel-star of Olympos, I in my exaltation let the Spring (Eiar) increase; and crossing the herald of the West-Wind (Zephyros), the turning-line which balances night equal with day, I guide the dewy course of that Season (Hora Eiar) when the swallow comes. Passing into the lower house, opposite the Ram, I cast the light equal day on the two hooves; and again I make day balanced equally with dark on my homeward course when I bring in the leafshaking course of the autumn Season (Hora Phthinoporon), and drive with lesser light to the lower turning-point in the leafshedding month. Then I bring Winter (Kheimon) for mankind with its rains, over the back of fish-tailed Aigokereos [Capricorn], that earth may bring forth her gifts full of life for the farmers, when she receives the bridal showers and the creative dew. I deck out also corn-tending Summer (Theros) the messenger of harvest, floggin the wheatbearing earth with hotter beams, while I drive at the highest point of my course in Karkinon (the Crab) [Cancer], who is right opposite to the cold Aegokereos [Capricorn] : both Neilos (the River Nile) and grapes together I make to grow. When you begin your course, pass close by the side of Kerne (Cerne), and take Phosphoros (the Morning Star) as guide to lead the way for your car, and you will not go astray; twelve circling Horai (Hours) in turn will direct your way.’"
"He [the god Dionysos] called to Helios (the Sun), reminding the chief of the stars of his love for Klymene, and prayed him to hold back his car and check the stalled horses with the heavenly bit, that he might prolong the sweet light, that he might go slow to his setting and with sparing whip increase the day to shine again." GOD OF THE SUN : THE SEVENTH "PLANET"
Late classical writers described seven zones of heaven each of which was ruled by one of the seven "planets"--the Sun, Moon, Mercury, Venus, Mars, Jupiter and Saturn. "He [Kadmos (Cadmus) founder of Thebes] dedicated the seven gates [of the new-founded city] to the seven planets [i.e. the Sun, Moon, Mercury, Venus, Mars, Jupiter, Saturn] . . . the midmost gate opposite the Dawn he dedicated to fiery Helios (the Sun), since he is in the middle of the planets." The mid-summer dawn-rising of the dog-star Seirios (Sirius) in conjunction with Helios the Sun was thought to be the cause of the scorching heat of midsummer and summertime drought. "‘But here, shall Gaia (the Earth) and shining Hyperion [Helios the Sun] make you [the monster Python] rot.' Thus said Phoibos [Apollon], exulting over her : and darkness covered her eyes. And the holy strength of Helios (the Sun) made her rot away there; wherefore the place is now called Pytho, and men call the lord Apollon by another name, Pythion; because on that spot the power of piercing Helios made the monster rot away." "Scorched by the sun's (Helios') bright beams, you shall lose the fair bloom of your flesh. And glad you shall be when spangled-robed night (nyx) shall veil his brightness and when the sun shall scatter again the frost of morning." "[Leaving] the Erythraian Sea's [the Red Sea's] sacred stream red of floor, and the mere by Okeanos (Oceanus), the mere of the Aithiopes (Ethiopians) [i.e. the headwaters of the Nile] . . . that giveth nourishment unto all, where all-seeing (pantoptês) Helios (the Sun) doth ever, in warm outpourings of soft water, refresh his undying body and his wearied steeds [i.e. as in the quote below, he melts the snows of Aithiopia to feed the river Nile]." "The Aithiopian (Ethiopian) land, where seven-channelled Neilos (the Nile) rolleth its refreshing tide, fed by abundant, wind-born rain, and therein the fire-eyed sun (pyrôpos Helios) beaming forth upon the earth, melteth the snow amid the rocks; and all luxuriant Aigyptos (Egypt), filled with the sacred flood, maketh to spring up Demeter's life-giving grain." "Helios (the Sun) suddenly shone out with all his warmth. The traveler no sooner felt his genial rays than he took off one garment after another." "Messenia is a land of fair fruitage . . . being neither very wintry in the blasts of winter nor yet made too hot by the chariot of Helios (the Sun)." "From the Okeanos-verge upsprings Helios (the Sun) in glory, flashing fire far over earth-- fire, when beside his radiant chariot-team races the red star Seirios, scatterer if woefullest diseases over men." "As one who lives in the vales of Arkadia, she [Palaistra the goddess of wrestling,] begs Helios (the Sun) for colour, and he brings it to her like a flower and reddens the girl with moderate heat." "When golden Sol (the Sun) [Helios] has driven winter in rout beneath the earth, and with summer light unlocked the sky." "[A land plagued with drought :] No soft breeze with its cool breath relieves our breasts that pant with heat, no gentle Zephyrus blows; but Titan [Sol-Helios the Sun] augments the scorching dog-stars's [Sirius'] fires, close-pressing upon the Nemean Lion's [i.e. Leo the summertime sign of the zodiac] back. Water has fled the streams, and from the herbage verdure. Dirce is dry, scant flows Ismenus' stream, and with its meagre wave scarce wets the naked sands. With paling light glides Phoebus' sister [Luna-Selene the Moon] athwart the sky, and the gloomy heavens are wan in the lowering day." "[Zeus assaulted the monster Typhoeus with volleys of hail :] She [Gaia the Earth] prayed to Titan Helios (the Sun) with submissive voice : she begged of him one red hot ray, that with its heating fire she might melt the petrified water of Zeus [i.e. hail], by pouring his kindred radiance over the frozen." "Phaethon [Helios the Sun] scourged her skin with his blazing fire." "Governor of the flaming stars, Phaethon [Helios the Sun], is himself a potentate all of fire." "Helios (the Sun) that fosters life upon the earth." Sokrates : Shall we discuss the sun (Hêlios), as you mentioned it first? . . . The Dorians call it Halios. Now halios might be . . . because he variegates the products of the earth, for variegate is identical with aiollein." “[Helios the Sun] bearing light, pure and fiery bright; bearer of fruit." "Helios (the Sun), giver of feason, plantdresser, lord of fruits! When will the soil make winemother grapes to grow?" "Beam of the sun! O thou that seest afar, what wilt thou be devising? O mother of mine eyes! O star supreme, reft from us in the daytime [i.e. a solar eclipse]! Why hast thou perplexed the power of man and the way of wisdom, by rushing forth on a darksome track? Art thou bringing on us some new and strange disaster? Yet, by Zeus, I implore thee, thou swift driver divine of steeds! Do thou, O queen! Change this world-wide portent into some painless blessing for Thebes. Is it because, in thine anger at the presumptuous sons of mortals, thou art unwilling utterly to blot out the pure light of life? But art thou bringing a sign of some war, or wasting of produce, or an unspeakable violent snow-storm, or fatal faction, or again, some overflowing of the sea on the plain, or frost to blind the earth, or heat of the south-wind streaming with raging rain? Or wilt thou, by deluging the land, cause the race of men to begin anew? I in no wise lament whate'er I shall suffer with all the rest." "[Hercules-Herakles, driven mad by Hera, believes he is witnessing an eclipse :] But what is this? Shadows have begirt midday. Phoebus [Sol-Helios the Sun] fares with darkened face though there be no cloud. Who puts the day to flight and drives it back to dawn? Whence does an unfamiliar night rear its black head? Whence do so many stars fill the sky though it is day?" "And thou, star of stars, O radiant Titan [Sol-Helios the Sun], dost thou behold this shame of thy race? Hide thy light and take refuge in darkness [perhaps an eclipse, or else hidden behind storm clouds]." "Dies (Day) [here meaning Sol-Helios the Sun] felt her presence [i.e. an Erinys summoned from Haides], Nox (Night) interposed her pitchy cloud [in a solar eclipse] and startled his shining steeds [i.e. as an omen of the coming fall of Thebes]." "A foreboding sign was shown to wine-faced Bakkhos (Bacchus) [Dionysos] in the sky [during his war with the Indians], an incredible wonder. For at midday, a sudden darkness was spread abroad, and a midday obscurity covered Phaethon [Helios the Sun] with its black pall, and the hills were overshadowed as his beams were stolen away. Many a stray brand fell here and there scattered from the heavenly car; thousands of rainshowers deluged the surface of the earth, the rocks were flooded by drops from the sky, until fiery Hyperion rose again shining high on his chariot after his hard struggle . . . Idmon the treasury of learned lore, for he had been taught the secrets of Ourania (Urania), the Mousa (Muse) who knows the round circuit of the stars : he had been taught by his learned art the shades on Selene's (the Moon's) orb when in union with the Sun, and the ruddy flame of Phaethon [Helios the Sun] stolen out of sight from his course behind the cone of darkness, and the clap of thunder, the heavenly bellow of the bursting clouds, and the shining comet, and the flame of meteors, and the fiery leap of the thunderbolt. Having been taught all these things by Ourania the goddess he stood with dauntless heart, while the limbs of every man was loosened [at the sight of the solar eclipse] . . .
And now to Dionysos, alone among the rocks which he loved, came Hermes his brother from heaven as messenger of Zeus, and spoke assuring him of victory : ‘Tremble not at this sign, even though night came at midday. This sign, fearless Bakkhos [Dionysos], your father Kronion (Cronion) [Zeus] has shown you to foretell your victory in the Indian War. For I liken Bakkhos the light-bringer to the sun shining again, and the bold black Indian to the thick darkness. That is what is meant by the picture in the sky. For as the darkness blotted out and covered the light of shining day, and then Helios (the Sun) rose again in his fireshining chariot and dispersed the gross darkness, so you also shall shake from your eyes far far away the darksome sightless gloom of the Tartarian Erinyes, and blaze again on the battlefield like Hyperion. So great a marvel ancient [an eclipse] eternal Khronos (Chronos, Time) our foster-father has never brought, since Phaethon, struck by the steam of fire divine, fell tumbling half-burnt from Helios's lightbearing chariot.’"
"Now there was an oracle among the gods that they themselves would not be able to destroy any of the Gigantes (Giants), but would finish them off only with the help of some mortal ally. When Ge (Gaia the Earth) learned of this, she sought a drug that would prevent their destruction even by mortal hands. But Zeus barred the appearance of Eos (the Dawn), Selene (the Moon), and Helios (the Sun), and chopped up the drug himself before Ge (Earth) could find it." "[Hercules-Herakles] for whose begetting the world lost a day, and Phoebus [Sol-Helios the Sun] with tardy light shone forth from the Eastern sea, bidden [by Jupiter-Zeus] to keep his bright car sunk beneath Oceanus' waves." "Of the portents recorded in ancient tales many did happen and will happen again. Such an one is the portent connected with the tale of the quarrel between Atreus and Thyestes . . . I mean the change in the rising and setting of the sun (hêlios) and the other heavenly bodies, how in those times they used to set in the quarter where they now rise, and used to rise where they now set, but the god at the time of the quarrel, you recall, changed all that to the present system as a testimony in favor of Atreus." "Zeus then sent Hermes to Atreus and told him to get Thyestes to agree that Atreus should rule [Argos], if Helios (the Sun) should journey backwards. Thyestes agreed, and Helios put his setting where he usually rose." "A father-in-law [i.e. Atreus] who puts to flight the clear beams of the sun, and turns away from the [cannibalistic] feast his affrightened steeds." "[Medea speaks of her grandfather Sol-Helios the Sun :] ‘Does he behold this [her betrayal by Jason], Sol (the Sun) [Helios], father of my race, and do men still behold him as, sitting in his chariot, he courses over bright heaven's accustomed spaces? Why does he not return to his rising and measure back the day?.’"
"[The witch Medea cries out to the gods of the sky :] ‘Thee too, bright Luna (the Moon) [Selene], I banish, though thy throes the clanging bronze assuage; under my spells even my grandsire's [Sol-Helios the Sun's] chariot grows pale and Aurora (the Dawn) [Eosn] pales before my poison's power.’"
"Circe turned to prayers and incantations, and unknown chants to worship unknown gods, chants which she used to eclipse Luna's (the Moon's) [Selene's] pale face and veil her father's [Sol-Helios the Sun's] orb in thirsty clouds." "She [the witch Medea] is one to strive to draw down from its course the unwilling moon (luna), and to hide in darkness the horses of the sun (sol)." "Often have I seen her [the witch Medea] in frenzy and assailing the gods [Sol-Helios the Sun and Luna-Selene the Moon], drawing down the sky." "At commandment of my [the witch Medea's] voice Phoebus [Sol-Helios the Sun] has halted in mid-heaven." "[The witch] Medea . . . than whom is none more potent at the nightly altars; for responsive to her cry and to the juices she scatters in desolate places the Stars are halted trembling and Solis (the Sun) [Helios] her grandsire is aghast as he runs his course." "Their [the Brahmans of India] inspired incantations have often enchanted Selene (the Moon) as she passes through the air like an untamed bull, and brought her down from heaven, and often stayed the course of Phaethon [Helios the Sun] swiftly driving his hurrying car." The lands beyond the rising- and setting-place of the sun in the river Okeanos were cloaked in eternal darkness. "[The Titanes] Iapetos and Kronos (Cronus) seated have no shining of the sun god Hyperion [Helios] to delight them nor winds' delight, but Tartaros stands deeply about them." "The vessel [of Odysseus] came to the bounds of eddying Okeanos (Oceanus), where lie the land and the city of the Kimmeroi (Cimmerians), covered with mist and cloud. Never does resplendent Helios (the Sun) look on this people with his beams, neither when he climbs towards the stars of heaven nor when once more he comes earthwards from the sky; dismal night overhands these wretches always." "So did these ghosts travel on together squeaking, while easeful Hermes led them down [to the Land of the Dead] through the ways of dankness. They passed the streams of Okeanos (Oceanus), the White Rock (petra Leukas), the Gates of the Sun (pylai Hêlioi) and the Land of Dreams (demos oneiroi), and soon they came to the field of asphodel, where the souls (psykhai), the phantoms (eidola) of the dead have their habitation." "And there [at the ends of earth, sea and sky] the children of dark Nyx (Night) have their dwellings, Hypnos (Sleep) and Thanatos (Death), awful gods. Glowing Helios (the Sun) never looks upon them with his beams, neither as he goes up into heaven, nor as he comes down from heaven." "I [Hercules-Herakles] have seen places unapproached by any [i.e. the land of the dead], unknown to Phoebus [Sol-Helios the Sun], those gloomy spaces which the baser pole hath yielded to infernal Jove [Haides]." "The all-seeing, all-hearing Helios (the Sun)." "Helios (the Sun), who is watchman of both gods and men . . . You [Helios] with your beams look down from the bright upper air (aitheros) over all the earth and sea." "None knows to give clear report of this [i.e. the fate of Menelaus who was lost at sea in a storm]--except only Helios (the Sun) that fosters life upon the earth." "[The Titan Prometheus calls upon the universe to witness his torment :] O you bright sky of heaven (dios aithêr), you swift-winged breezes (takhypteroi pnoiai), you river-waters (pêgai potamôn), and infinite laughter of the waves of sea (pontos), O universal mother Earth (panmêtôr gê), and you, all-seeing orb of the sun (panoptês kyklos hêlios), to you I call! See what I, a god, endure from the gods." "Sol [Helios] is the first to see all things." "Sol (the Sun) [Helios] gazes far and wide on the day's deeds." "[The ghost of Phrixus warns Aeetes that the theft of the Golden Fleece will presage the destruction of his realm :] [Aeetes] prayed to the godhead of his sire [Sol-Helios the Sun] and to his chariot as it rose above the eastern strand : ‘This prayer do I make to thee, O father, guardian of my destiny, all-seeing one! Cast now thine eyes upon the land, upon all the sea; whether it be men of my own land or strangers that are planning secret treachery, be first to bear me news.’"
Helios was the god of sight who could heal the blind--such as the giant Orion--or blind those who offended him--such as Phineus. The ancient Greeks likened sight (theia) to the rays of the sun. They believed that the human eye emitted an invisible beam which allowed one to see whatever it touched. Indeed, the three light-emitting gods--Helios (the Sun), Selene (the Moon) and Eos (the Dawn)--were named children of Theia (Sight). "Beam of the sun! O thou that seest afar, what wilt thou be devising? O mother of mine eyes!" "‘Visibility and the faculty of sight is precious . . . Which one can you name of the divinities in heaven as the author and cause of this, whose light makes our vision see best and visible things to be seen?’ ‘Why, the one that you too and other people mean for your question evidently refers to the sun (helios).’ ‘Is not this, then, the relation of vision to that divinity?’ ‘What?’ ‘Neither vision itself nor its vehicle, which we call the eye, is identical with the sun.’ ‘Why, no.’ ‘But it is, I think, the most sunlike of all the instruments of sense . . . And does it not receive the power which it possesses as an influx, as it were, dispensed from the sun? . . . Is it not also true that the sun is not vision, yet as being the cause thereof is beheld by vision itself? . . . Directed upon objects illumined by the sun, they see clearly, and vision appears to reside in these same eyes.’"
Helios was called upon to witness the most solemn of oaths for the all-seeing god could report any breach to the deities who punished oath-breakers. "[Agamemnon insists the Trojans swear an oath to respect the outcome of a duel between Paris and Menelaos :] ‘Bring two lambs [for the oath-swearing]: let one be white and the other black for Gaia (the Earth) and Helios (the Sun), and for Zeus we well bring yet another. Bring, that he may seal the pledges . . . Priamos himself, for his sons are outrageous, not to be trusted; lest some man overstep Zeus' oaths, and make them be nothing.’ . . . The heralds led up the victims for the gods' oaths, and in a great wine-bowl mixed the wine, and poured water over the hands of the princes. Atreus' son [Agamemnon] laid hands upon his work-knife, and few it from where it hung ever beside the mighty sheath of his war sword and cut off hairs from the heads of the lambs; and the heralds thereafter passed these about to all the princes of the Trojans and Akhaians. Atreus' son uplifting his hands then prayed in a great voice : ‘Father Zeus, watching over us from Ida, most high, most honoured, and Helios (the Sun), you who see all things, who listen to all things, Gaia (the Earth), and Potamoi (Rivers), and you who under the earth take vengeance on dead men [i.e. the Erinyes], whoever among them has sworn to falsehood, you shall be witnesses, to guard the oaths of fidelity . . .’ So he spoke, and with pitiless bronze he cut the lambs' throats." "[Agamemnon swears under oath to Akhilleus (Achilles) that he hasn't lain with the slave-girl Briseis :] He cut first away the hairs from the boar, and lifting his hands up to Zeus, prayed . . . He spoke before them in prayer gazing into the wide sky : ‘Let Zeus first be my witness, highest of the gods and greatest, and Gaia (the Earth), and Helios (the Sun), and the Erinyes (Furies), who underground avenge dead men, when any man has sworn a falsehood, that I have never laid a hand on the girl Briseis . . .’ So he spoke, and with pitiless bronze he cut the boar's throat." "[The witch Medea swears an oath :] ‘I swear by Helios' (the Sun's) sacred light and by the secret rites of Perses' night-wandering daughter [Hekate].’"
"[King Aeetes makes a pledge to the Argonauts :] ‘Let Helios (the Sun) be my witness and Phasis the king of our Rivers.’"
"[Helios the Sun] foe to the wicked, but the good man's guide, over all his steps propitious you preside . . . Faithful defender, and the eye of right." "[Jason swears an oath to Medea :] ‘I pray, by thy line, and by the godhead of thy all-seeing grandsire the sun [Sol-Helios], by the three-fold face and holy mysteries of Diana [i.e. Hekate], and by the gods of that race of thine--if so be gods it have--by all these, O maiden, have pity upon me, have pity on my men; be kind to me and make me thine for ever!’"
"[Medea, forsaken by Jason, reminds him of his oath to her :] ‘By the gods above, by the light of my grandsire's [Sol-Helios the Sun's] beams, by my favours to you . . .’"
"[King Oedipus swears an oath :] ‘Now at Heaven's command let the crime be expiated [the murder of king Laius]. Whoever of the gods dost look with favour upon kingdoms--thou [Jupiter-Zeus], thou whose are the laws of the swift-revolving heavens; and thou [Sol-Helios the Sun], greatest glory of the unclouded sky . . . and thou, his sister [Luna-Selene the Moon] . . . thou [Neptune-Poseidon] whom the winds obey . . . and thou [Pluto-Haides] who dost allot homes devoid of light--do ye all attend : Him by whose hand Laïus fell may no peaceful dwelling, no friendly household gods, no hospitable land in exile entertain.’"
"Thee, thee [Jupiter-Zeus], O sire of the heavenly gods, I call to witness, and thee [Sol-Helios the Sun], bright radiance of celestial light, on whom as founder of this house of ours depends." "First I will swear to you by Sol (the Sun) [Helios] the all-seeing that what I'm telling you it true." "[The Indian Deriades swears :] ‘I bring as witnesses Helios (the Sun), and boundless Gaia (the Earth), and India's god, holy Hydros (Water) [the river Hydaspes].’"
One of the powers attributed to witches was the power of the evil eye--a malicious gaze which caused misfortune. As the god of sight and the powerful rays of the sun, Helios was naturally regarded as the source of this power. His children by Perseis--an Okeanid-nymph identified with Hekate Perseis the goddess of witchcraft--were the three famed witches of myth--Kirke (Circe), Pasiphae and Aeetes, father of the witch Medea. "[Description of the witches Medea and Kirke (Circe) :] All the Children of Helios (the Sun) were easy to recognise, even from a distance, by their flashing eyes, which shot out rays of golden light." "Her [Phaedra's] eyes, which once shone like Phoebus' [Sol-Helios the Sun's] torch, no longer gleam with their ancestral fire [i.e. Phaedra was the daughter of Pasiphae, daughter of Helios]." Apollon was identified with the sun-god Helios by a few early Greek poets and philosophers. The pair were only fully conflated, however, by the Roman poets--Ovid, Virgil, Seneca, and others. But even in this case poets such as Ovid referred to the sun-god as "Phoebus" rather than "Apollo." Further, when they mention Phoebus the sun, they often name him "Hyperionides" (Son of Hyperion), and "Titan" (the Titan-God) in the same passage. The name "Apollo," on the other hand, was almost exclusively used for non-solar references, i.e. for the god of music, oracles and poetry. I have included all the Latin references to the sun-god Phoebus within the Helios section of this site rather than the pages covering Apollon. 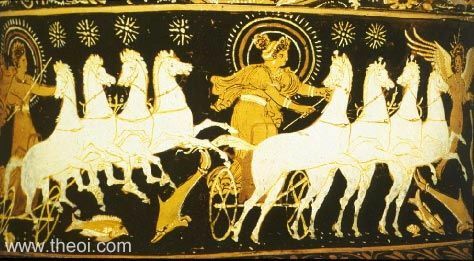 This better coincides with the Greek versions of the myths--for example, the story of Phaethon, in which Helios rather than Apollon is the boy's father. "And you Helios (the Sun), who strike with your bright rays the everlasting heavenly vault, send on our enemies a far-shot arrow from your bowstring, oh ie Paian [Apollon]." "That Apollon is the same as the sun and that one god is furnished with two names is made clear to us by the mystical words spoken in the secret initiation rites and by the popular refrain which can be heard everywhere : The sun is Apollon and Apollon is the sun." "The sun's bright beams (hêliou phoibêi phlogi)." "The unseen land [i.e. the underworld] where Apollon [here the sun] does not walk, the sunless (analion) land that receives all men." "Danaus : Invoke now also that bird of Zeus [i.e. the sun]. Chorus [of Danaides] : We invoke the saving beams of the sun (helios). Danaus : Pure Apollon, too, who, though a god, was exiled once from heaven." In Aeschylus' lost play Bassarae the Thrakian bard Orpheus worships Apollon as the sun-god. Weir Smyth (L.C.L.) summarises evidence of the plot : "Eratosthenes, Catasterismoi, says of Orpheus that he paid no honour to Dionysos, but considered Helios to be the greatest of the gods and addressed him as Apollon; that, by making haste during the night, he reached at dawn the summit of Mt. Pangaios, and waited there that he might see the rising of the sun (as Aeschylus tells the story)." "The name Apollo is Greek; they say that he is Sol (the Sun), and Diana [Artemis] they identify with Luna (the Moon); the word Sol being from solus, either because the sun ‘alone’ of all the heavenly bodies is of that magnitude, or because when the sun rises all the stars are dimmed and it ‘alone’ is visible." "You say that Sol the Sun and Luna the Moon are deities, and the Greeks identify the former with Apollo and the latter with Diana [Artemis]." Greek Lyric V Euripides, Fragments - Greek Lyric C5th B.C. Greek Lyric V Philoxenus, Fragments - Greek Lyric C5th - 4th B.C. Plato, Statesman - Greek Philosophy C4th B.C.